iPhoneography is gaining popularity and as the quality of phone cameras improves it is being taken more seriously, the video functions on phones is also very good allowing you to capture full HD footage on the device you carry with you every day. Time lapse is performed by taking photographs at set intervals and then combining them to form a movie. Smartphones are an ideal tool for capturing time lapses with no additional equipment. By using a free or low cost app you can either use the phone to capture a series of stills or to capture and produce a video clip. Other apps that can capture and produce timelapse movies are iMotion HD and Miniatures (the free version is limited to lower res 10s clips) but this can also add the tilt-shift effect to your movies, which is quite effective combined with time lapse. One limitation of making time lapse movies is that it is difficult to pan the camera during the capture of the images without jerking. I use a small device to rotate the phone whilst the images are being captured. Following on from last month’s spectacular displays of the Aurora Borealis the theme for National Photography Awards UK’s themed competition for March is “Northern Lights”. This month’s themed competition is ‘Northern Lights’. Entries are now open – We want to see your images of the beautiful Aurora! 1st, 2nd and 3rd place winners will see their images featured on our website & FB page and winning images will automatically be entered into our Astronomy Photographer of the Year category! The Northern Lights themed competition is FREE to enter and deadline for entries is midnight on 31st March. Don’t forget you can also enter your general Astronomy images into our Monthly Awards. For more information and to enter, please visit our website. Good Luck! What Digital Camera are offering the chance to win this lens worth £1000 to one lucky winner. Win a Fujifilm X-M1 and lens worth £600! What Digital Camera are also giving you the chance to win a Fujifilm X-M1 and lens. To celebrate the power of vision and the wonder of our eyes, GetLenses are giving away £500 worth of vouchers to spend on photography equipment from Amazon UK. All you have to do is send us a photograph you’ve taken of a sight or object that reminds you of an eye. This could be anything from clouds in the sky, the froth on your coffee cup, or even water draining through a plughole. If you think it looks like an eye, we want to see it. The more imaginative, the better. So get your creative cap on and get snapping! DiscoverWildlife.com have a Mountain Series Loka camera bag and Internal Camera Unit insert, worth £230, to give away, courtesy of f-stop. One lucky winner will win a lightweight, weather-resistant, 37-litre camera bag ideal for outdoor use. The Loka has room for kit, food, water, and other daily essentials. It is compatible with all f-stop Internal Camera Units (ICUs), up to a large pro series. Following on from my pick of iOS Photography Apps its time to take a look at Android apps. I’ve applied the same criteria to my selection of Android Apps – they must be free or low cost. This is a free depth of field calculator that has one of the easiest and most pleasant user interfaces for this type of app. Other app developers should take note. The first step is to select your camera, thankfully you don’t need to know the exact size of sensor just select the correct manufacturer range and you’re good to go. After that its just a case of dialling in your preferred aperture, focal length and focus distance, pay attention to the units The app then gives you the near and focus limits for your chosen values and the hyperfocal distance for your chosen aperture and focal length. This is also shown pictorially which is handy. This free exposure calculator is just about as simple as it gets. Ideal for using with strong ND filters, simply meter in camera without the filter then enter the shutter speed and the filter strength in stops and the app does the rest. We even get a timer for those exposures that are longer than the camera’s pre-programmed shutter speeds. The only drawback when using this app is the lack of aperture control, a change in aperture would require you to remove the filter and meter for the new f-stop setting or work out the adjustment to the original exposure yourself which kind of defeats the purpose. Also on longer exposures if your device goes to sleep the timer alarm doesn’t go off. Another free exposure calculator, this one addresses an omission from the previous calculator I looked at, however the layout of the UI is a little awkward, particularly on a tablet when the layout goes a little wonky. Using the + and – buttons enter your metered exposure and the adjustment required. Then enter your desired ISO and aperture to calculate the shutter speed. If you have a preferred shutter speed that you want to use then you can calculate the f-stop or ISO required. This app is missing the timer function but the stopwatch or countdown timer on your device can be used instead. The UI isn’t the prettiest but it is functional. You can start with the Hyper-focal length however the drop downs aren’t the easiest way to set the values the results are displayed clearly as text. The Depth of Field calculator also uses the drop downs for the selection of focal length and aperture but you can type the focus point. The app then calculates the DoF and also gives the hyper-focal point. A nice touch is the inclusion of a multiple exposure EV calculator. This is used with film cameras and gives the exposure adjustment required per frame. 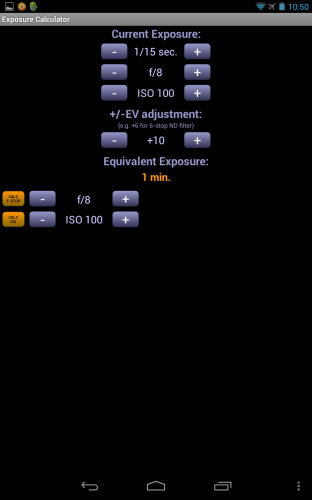 The Exposure Calculator again uses the dropdowns to set ISO and aperture from your metered exposure but you can type in the shutter speed either as a fraction or a decimal (1/125 = 0.008). Then set the strength of the filter or with no filter you can simply calculate equivalent exposures. 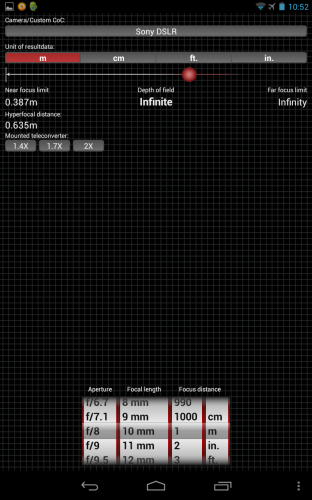 Finally set your target ISO and aperture and calculate the shutter speed. You can then send your calculated time to a timer which can also run as a service allowing very long exposure times to be set and retain the ability to be alerted even when the device goes to sleep. 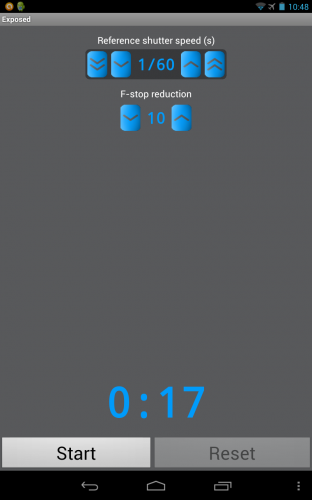 The timer can also be set independently. The app also links up to Catch Notes, allowing you to easily log notes about settings etc. Another function that is probably less useful allows you to measure the distance from your subject to your camera, this only really works over longer distances as it uses GPS which limits its applications. If you want to know where and when the sun will set and rise along with its path then this is the app for you. The pro version is £4.25 and adds functionality and removes ads. 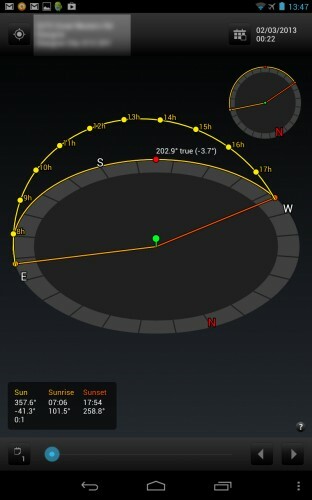 The Lite version only shows the path and times for your current location, but does allow you to change the date so that you can plan a return when the sun will set in a particular area on the horizon. The pro version gives the ability to check for different locations, which when used in conjunction with mapping sites will help you work out when to visit particular locations and also uses mapping APIs and augmented reality and adds widgets.